Microsoft has announced today that its upcoming Office 2016 will be released later this year. 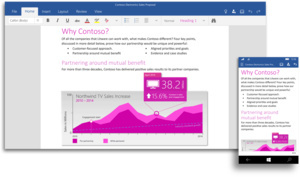 The software giant had little to share except to say: "We will have more to share on Office 2016 in the coming months, but this suite will remain the comprehensive Office experience you're long familiar with, best suited for a PC with keyboard and mouse. We expect to make Office 2016 generally available in the second half of 2015." Microsoft's new version of the popular software suite will include a dark theme, and a slight resurrection of "Clippy" who can assist with learning features. The UI will look similar to Office 2013, but will extend to include new features from Windows 10. All of the software will be more touch-friendly, as well. A preview will be available in the coming weeks, with the full release slated for later this year. Ehhh.......who cares. Office 2013 is just great and not gotten old yet. Hell, '03 still runs like a champ. Either way, I can't think of one advantage over LibreOffice. lets see here a always on ddm controlled office suite that requires product activation services and microsoft one drive. When i can use libreoffice which is free doesn't dial home and opens all formats including office.